Installation: Copy the contents of the ZIP file to the ext folder of your phpBB forum. 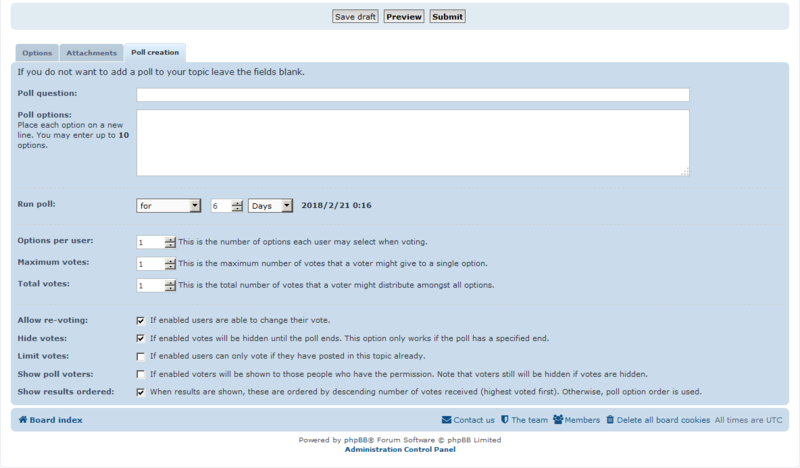 Then enable the extension 'Advanced Polls' in Manage extensions (CUSTOMISE tab) in the ACP. Subsilver2 style has NOT been tested with this version. Incomplete or outdated translation: German, French, Hebrew, Italian, Dutch, Russian, Swedish. Translators, please, complete translations, and send PRs or language translations to be included. If you have further suggestions for new functionality, please, mention them here and they will be evaluated and potentially included (no commitments!). Bug reports for this extension in this thread, please, or on GitHub. Last edited by jasolo on Fri May 11, 2018 9:58 am, edited 3 times in total. Added check to avoid votes greater than the maximum value (a user could change the value in the select element using developer tools in his browser and submit votes outside the expected range). In fact, the first feature would not be so necessary with the second feature. In the old version 1.1.0-b1, this page appears correctly. Thanks for the report. The problem is similar to one resolved by javiexin, that required not to activate poll end notifications. Although this version uses that solution, the error has returned. I will check it, but notifications have been a problem since phpBB 3.2 so I do not rule out removing that feature. Removed all the code related to notifications. 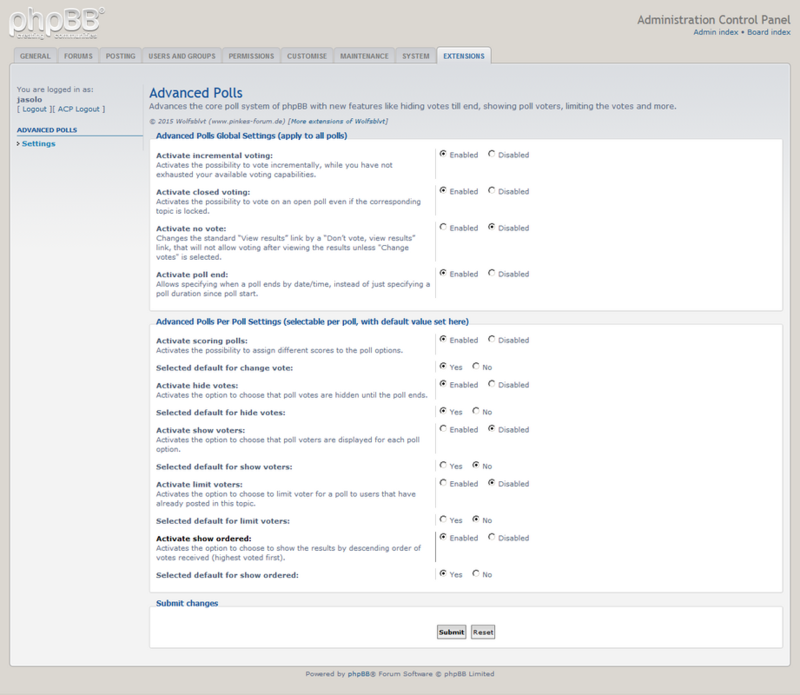 It was outdated for phpBB 3.2 and it disrupted the forum notifications. I did not use the Poll Ended Notification feature in my forums, but maybe I am the exception. Depending on the interest I could add it to the planned features list. Thank you for your response and the modification of this new version. We did not use notifications for polls. In the Settings, I disabled "Activate show voters", but moderators and administrators can see the voters. Is it possible to hide the voters for them also ? Change the "Can view poll voters" permission to "No" in those groups. More info about the permissions of this extension here. None of the screenshot images in the OP of this topic are view-able. Can they be updated? Updated. I had updated all the Postimage links in the forums where I am the administrator, so I thought the same action have been made in this forum. Extension installed and so far working great! Thanks for your work on this! Much appreciated! Question: if poll results are chosen to be "hidden" until the polling period has ended, is it possible for forum Admin/Founders to be able to see how many people have voted in the poll (prior to close)? Yes, as you can see in the "Moderator Internal View" image in the first post of this topic.